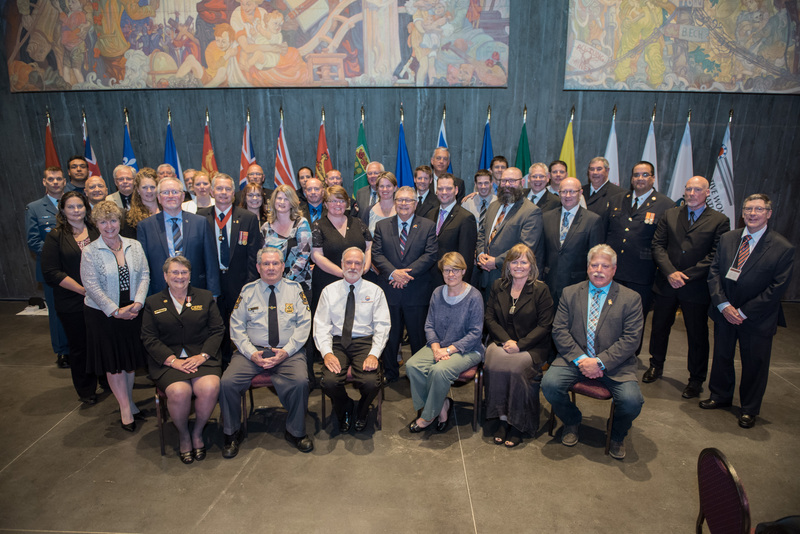 The Honourable Ralph Goodale, Minister of Public Safety and Emergency Preparedness, the Honourable Shaye Anderson, Minister of Municipal Affairs and Minister responsible for the Alberta Emergency Management Agency, and the Honourable Derek Mombourquette, Minister of Municipal Affairs in Nova Scotia, are pictured with the 2017 award recipients of the Emergency Management Exemplary Service Award. Mr. Mueller is an emerging professional dedicated to the Alberta Resilient Communities (ARC) research project. Mr. Mueller developed the prototype for the "Raspberry Pi-Rate" project, which is a low-cost communication system designed to be used in disaster scenarios. The "Raspberry Pi-Rate" project is a unique and innovative application of accessible materials that has the potential to connect separated loved ones in emergency situations. Mr. Mueller is also an active member of Winsport Park's Junior Ski Patrol, a group that responds to medical emergencies and safety issues in the park. Mr. Mueller has shown great technological innovation and commitment in his endeavor to enhance community resilience in the face of emergencies. Ms. Thompson has worked in various positions across Canada in the field of emergency management. She developed a damage assessment protocol for the City of Burnaby, which informed part of the city's wider emergency management program. In 2015, Ms. Thompson created a management framework for the Special Events Emergency program in the city of Toronto, where she worked to integrate and improve the use of data analytics in emergency management programs. Ms. Thompson also redeveloped the Hazard Identification and Risk Assessment Analysis, which evolved into a data-driven analysis that is now the current standard for the City of Toronto. 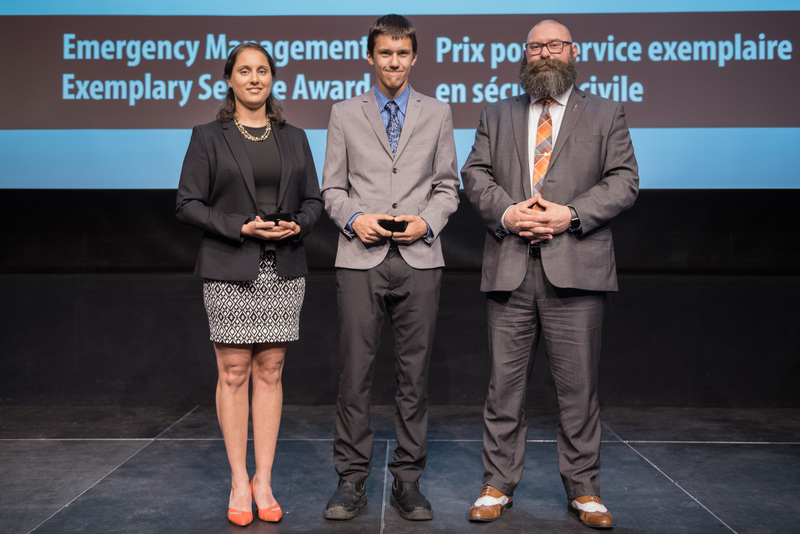 In 2016, she joined the board of the Ontario Association of Emergency Managers, where she developed the "Rising Star Award" to recognize the contributions of young professionals in emergency management. Ms. Thompson has shown commitment to fostering innovation through data analytics and building evidence-driven culture within government emergency management, and she is a great advocate for fellow youth in the field. The Honourable Shaye Anderson, Minister of Municipal Affairs and Minister responsible for the Alberta Emergency Management Agency (far right), is pictured with the 2017 award recipients of the Emergency Management Exemplary Service Award for the Youth category. The Alberta Health Services (AHS) Mental Health Promotion and Illness Prevention (MHPIP) team has been proactive in their work to support Alberta Health Service's disaster recovery planning for the 2013 Southern Alberta Flood and the 2016 Fort McMurray Wildfire, along with a number of smaller-scale events across Alberta. The MHPIP team developed and distributed over 30 new disaster psychosocial resources, tools and training materials to support performance capacity and promote population health and well-being post-disaster. The MHPIP has also adapted these trainings for use by special populations, including schools and Indigenous communities. The MHPIP team's implementation of province-wide initiatives to support psychosocial disaster recovery has helped advocate for mental health to be considered an integral facet of disaster management, particularly during the recovery phase. The Kawawachikamach, Matimekush-Lac John, Schefferville Standing Joint Emergency Management Committee (SJCEM) is made up of citizens and stakeholders from the isolated communities of Schefferville, Matimekush-Lac John and Kawawachikamach. These communities are located in the heart of a sector of mining operations and industrial and transportation activities that puts them at an increased risk of accidents involving hazardous and toxic substances. The Kawawachikamach, Matimekush-Lac John, Schefferville SJCEM was created in 2014 to help the communities pool their resources and develop an emergency management program tailored to local circumstances and informed by intercultural considerations. SJCEM initiatives have included emergency preparedness exercising and the testing of emergency alerts for a major electrical outage. The tripartite work of the SJCEM allows for a collaborative emergency management approach that helps protect the health, security, essential infrastructure, land, and environment of all 3 communities and its citizens. The accidental release of a significant amount of oil in the St. Lawrence River would create issues for the health and safety of its surrounding communities and environments and the management of these issues would be split between multiple private and public organizations. Through the initiative of representatives of Énergie Valero, a planning group was established in 2015 for Opération Phare Valero, a complex emergency preparedness exercise to help prepare for such an event. Over a dozen organizations responded to Valero's invitation to take part in the exercise that simulated a marine incident. The operation which took place in 2016 with nearly 150 participants enabled participating organizations to familiarize themselves with one another and to figure out a collaborative and effective approach should an oil spill prompt an emergency response. Mr. Durnin, who works as a Fire Management Officer, has been a member of Parks Canada's incident management teams since 1990 and has extensive experience managing wildfires in national parks and sites across Canada. Mr. Durnin has increased public understanding of wildfire risks and has advised on proper measures to reduce the risk of wildfires. He has also built and maintained fuel breaks to protect the park community of Waskesiu Lake and the adjacent recreational area known as "Elk Ridge Resort" in the event of a wildfire. Mr. Durnin has worked closely with First Nations Communities to help develop fire management plans and wildfire risk reduction strategies on the Prince Albert National Park and First Nations Community lands. Mr. Durnin's passion for fire management encourages proactive fire management engagement and promotes safer communities. Following the Regional Municipality of Wood Buffalo wildfire, Ms. Hackman-Carty had an integral role in supporting the recovery of the community. She managed and led a team of experts on the implementation of a complete Economic Opportunity and Recovery Assessment for the region and worked with the Regional Municipality of Wood Buffalo to set up and run the Business Recovery Hotline to validate businesses for Canadian Red Cross Emergency Relief. In 2017, Ms. Hackman-Carty launched a pilot project to bring economic resilience training for community and regional leaders to four Alberta communities. Ms. Hackman-Carty's important work in fostering community resilience is further reflected by the release of her series of preparedness, response and recovery guides for families, business and communities. Mrs. Pollon founded the Bridges of Love Ministry in 2004, which provides Community Emergency Response Team training (CERT) for volunteers who want the capacity to positively respond in times of disaster. The Bridges of Love Ministry consists of over 50 churches and over 50 trained CERT volunteers who are coordinated, equipped, and ready to respond to disasters in Alberta. Following the 2013 Alberta floods, the Bridges of Love Ministry coordinated a virtual donation website, making the connection between donors, flood victims and volunteers, while avoiding stockpiles. Mrs. Pollon's work to develop an integrated network of local churches has complemented and strengthened existing secular emergency management organizations to enhance community resilience in the event of an emergency. The Public Education Team from Ontario's Office of the Fire Marshal & Emergency Management, made up of Ryan Betts, Aman Kainth, Jude Kelly, and Ian Ali, launched the #PrepareYourSelfie campaign during Emergency Preparedness Week 2016. The #PrepareYourSelfie project serves to reinforce the importance of safety before, during, and after emergencies. Ontarians were encouraged to "prepare their selfie" and share it via social media to demonstrate how they were personally prepared for emergencies. The #PrepareYourSelfie hashtag garnered over 3 million impressions on social media through the participation of emergency management stakeholders, provincial ministries, high-profile community events and public engagement. The two successful iterations of the campaign have helped heighten public awareness about the importance of emergency preparedness. Commander Susan Henry, Commander Ken McMullen and Deputy Commander Coby Duerr lead Canada Task Force 2 (CAN-TF2). CAN-TF2 is a volunteer Heavy Urban Search and Rescue team with the capacity to provide Incident Management expertise, rescue, medical support, and logistics to disaster-afflicted communities. CAN-TF2 was deployed during the 2011 Slave Lake fires, the 2013 Southern Alberta floods and, in 2016, these three leaders managed and helped coordinate the largest and longest Canada Task Force response in Canadian history when they were deployed to Fort McMurray for the Wood Buffalo wildfires. The leadership of Commander Henry, Commander McMullen, and Deputy Commander Duerr is crucial to ensuring the safety and resiliency of their incredible team of experts and the local affected community. 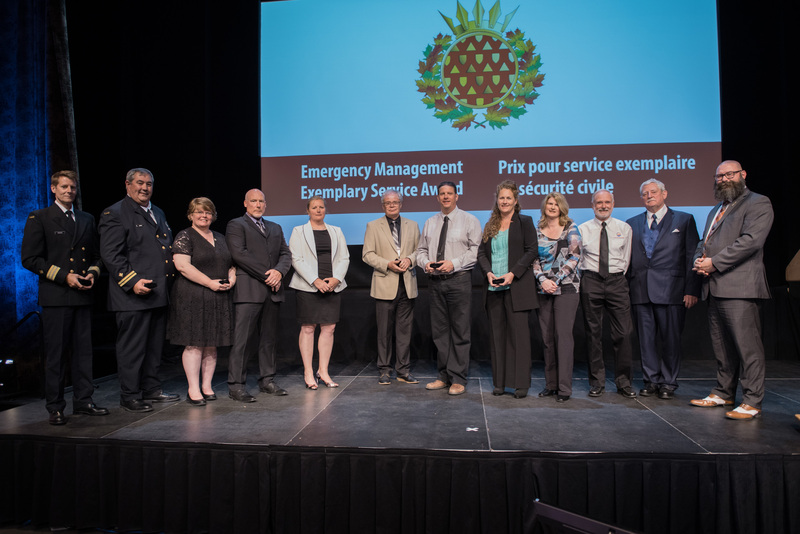 The Honourable Derek Mombourquette, Minister of Municipal Affairs in Nova Scotia (far right), is pictured with the 2017 award recipients of the Emergency Management Exemplary Service Award for the Resilient Communities category. Mr. Lathem joined the Nova Scotia Emergency Management Office (EMO) in 2005 and retired in the fall of 2017. Prior to joining the Nova Scotia EMO, Mr. Lathem served 30 years with the Royal Canadian Mounted Police, in four divisions across the country. Over his career with the RCMP, Mr. Lathem oversaw the investigation of the 1998 Swiss Air accident, one of Canada's worst aviation disasters. He also encouraged the collaboration of Atlantic emergency management leaders, focusing on building collaborative capacity in the areas of mitigation, response and recovery planning. Mr. Lathem was instrumental in contributing to support and response to the Southwestern Nova Scotia drought (2016) and Cape Breton Flood (2016-2017). Mr. Lathem has been instrumental in supporting many efforts to further emergency management in Nova Scotia, regionally, nationally, and internationally. Mr. Manuel began as the City of Dartmouth (later Halifax Regional Municipality) emergency management coordinator in 1993. He has been instrumental in the response to many local incidents. For example, Mr. Manuel coordinated the response and recovery to Hurricane Juan in 1993, the Swiss Airlines crash in 1998, and urban interface wildfires in 2008 and 2009. Mr. Manuel taught at the Canadian Emergency Preparedness College prior to its closure, and he continues to facilitate emergency management courses at Algonquin College in Ottawa. Mr. Manuel also led the development of Nova Scotia Special Care Emergency Preparedness Association (NSSCEPA) to help special care facilities in the province plan to respond to emergencies. Mr. Manuel is known for his ability to facilitate responders during an emergency event and has helped foster and promote emergency management locally, regionally, and nationally. Mr. Stoesz served as the Emergency Management Coordinator of Rhineland Town for approximately 16 years and has held a number of volunteer roles in Altona, including as a volunteer firefighter from 1979 to 1997. Mr. Stoesz coordinated emergency responses to several incidences in Rhineland and was instrumental in implementing Rhineland's original emergency measures plan. Mr. Stoesz's efforts were critical in the development and implementation of the Early Weather Warning Radio System, the Outdoor Emergency Warning Siren, and the Emergency Operations Centre in the town of Altona. Mr. Stoesz's efforts to increase public awareness of and preparedness for potential emergencies, have promoted resilience in communities and increased the public's preparedness level. Ms. Clark has had a long career in the public service across a variety of positions in federal, provincial and municipal organizations. For the past 12 years, Ms. Clark has been the Emergency Manager for the County of Simcoe, responding to tornadoes, floods, Syrian refugees, and other events. Ms. Clark has enhanced disaster response capacity and coordination through the development of regional large-scale emergency exercises. Recently, she has worked to develop and implement a comprehensive region-wide emergency management training program, and has worked on three signature projects: the development of a regional multi-disciplinary, multi-jurisdictional CBRN incident response plan; the development of a regional emergency management plan for opioid overdose outbreaks; and, the regional consequence management plans for the 2010 G8/G20 Summit and the 2015 Pan Am Games. Ms. Clark also developed and implemented a web-based emergency management portal, enabling key stakeholders and emergency response agencies to access a location, critical resources, plans and other relevant information. Ms. Clark's ongoing commitment and contributions to the emergency management field have fortified the region's responsiveness and built capacity across the region and beyond. Mr. Terletski has been the Municipal District of Foothill's director of Emergency Management since 2003. He enhanced the Emergency Management program at the Municipal District of Foothills through dedication to professional development, training and recertification. Mr. Terletski's staff is now sought out by the Alberta Emergency Management Agency to assist other municipalities in times of crisis. Mr. Terletski led the response of the 2013 Southern Alberta flood that included the rescue of 75 people from rooftops and approximately 250 home evacuations. He launched the Municipal District of Foothill's emergency alert system that alerts the over 1867 subscribers in the event of any potential emergencies. Mr. Terletski joined Canada Task Force 2 in September 2016 to assist in the development of training and deployment of exercises. Mr. Terletski has implemented multiple new Emergency Management initiatives and training to keep the Municipal District of Foothill safe from future events. Mr. Colvin is currently an Emergency Management Coordinator for the County of Perth and has taken an active role in bringing various emergency responders together in both public and private sectors over the course of his career. Mr. Colvin was one of the key founders of the CANWARN Severe Weather Watch program in London, which provides early warning on severe weather. Mr. Colvin also played a key role in designing, implementing and maintaining London's Emergency Operations and Training Centre. Mr. Colvin has worked on projects involving emergency preparedness, prevention and response, hazardous materials response and incident command. Mr. Colvin is a Certified Emergency Manager with the International Association of Emergency Managers. Mr. Colvin's knowledge, dedication, and endless passion for emergency management have helped cultivate a more disaster resilient culture. Mr. Bussey was the senior emergency management official for the Government of Northwest Territories (GNWT) for 25 years, with the first 15 of those years including responsibility for emergency management in Nunavut. Mr. Bussey expanded the Territorial Emergency Response Committee (TERC) through the active engagement of federal government agencies, the Canadian Forces and RCMP in GNWT in emergency preparedness, planning and response. Mr. Bussey assisted the Canadian Forces in the planning and conducting of regular Arctic exercises and contributed to the establishment of the Civil Air Search & Rescue Association and the Canadian Coast Guard Auxiliary units in the Northwest Territories and Nunavut. Mr. Bussey led the development of Highway Emergency Alerting Protocols to guide healthcare professionals, ambulance services and RCMP throughout the Northwest Territories. Mr. Bussey has shown a sustained commitment to excellence in emergency management programming through his professional career and has been a key advocate for the northern perspective on major emergency management issues. LCol. Stasyna (Retired) has over 37 years of municipal experience and 33 years of experience working with the Department of National Defence and is currently a Program Manager with the York Region Emergency Management Program. LCol. Stasyna has led numerous large scale municipal exercises at the regional and municipal levels to help better prepare municipal emergency control groups to respond to the needs of their communities in a crisis. LCol. Stasyna has supported Emergency Management Training and Education at the federal, provincial and municipal levels to develop the curriculum using his own academic experience. He has also served as director of the board for St. John Ambulance for York Region, and he has worked as a staff member and volunteer for the Canadian Red Cross Society. Over the course of his career, LCol. Stasyna has played a crucial role in emergency management and planning from mitigation, preparation, response, and recovery components in making his community, province, and country more safe and secure. Ms. Smysnuik is a Coordinator at the City of Toronto Office of Emergency Management and a Certified Emergency Manager (CEM). Ms. Smysnuik has been directly involved in all aspects of emergency management, including planning, training, exercises and operational response to major emergencies. Ms. Smysnuik has worked on a number of projects, including the development of emergency plans, standard operating procedures, emergency support functions, training course development and delivery, public education program development and the implementation and coordination of continuity of operations plans. Ms. Smysnuik has conducted full scale functional exercises in coordination with external stakeholders, City Divisions and other levels of Government. Ms. Smysnuik has also initiated a number of programs including the development of an emergency risk communicator network and the emergency action planning process for special events. Ms. Smysnuik is a devoted emergency management professional who excels at building effective partnerships between various organizations, both public and private sector, to enhance the preparedness, response, and recovery capabilities of the City of Toronto. Chief Seth, Fire Chief for the County of Brant since July of 2017, contributed to the design, development and construction of the first Indigenous ambulance service in Ontario. Chief Seth's commitment to equipment and processes to support a modern ambulance service led to him becoming the go-to person for other First Nations ambulance services across Canada. Over the course of his career, Chief Seth has led multiple initiatives that enhance resiliency, including organizing the first Basic Emergency Management Course for staff at Six Nations. He initiated the development of emergency plans, hazard identifications and risk assessments, and exercises with local and external partners. He was also the inaugural President of the Ontario First Nations Fire Chiefs Association. Remaining firmly rooted in his Indigenous upbringing, Chief Seth has advocated for inclusion, standards-based training, and operational resilience in the field of emergency management. Dr. Michel C. Doré, Ph.D., is currently co-founder and president of the Canadian Risk and Hazards Network and co-chair of Canada's Platform for Disaster Risk Reduction. His emergency management career spans over 30 years. As Associate Deputy Minister for Public Safety in Quebec, he led the province's response to multiple events, such as the H1N1 pandemic in 2009. As Assistant Deputy Minister at Health Canada, he coordinated the implementation of the Federal Nuclear Emergency Plan in response to the Fukushima accident in 2011. He also taught emergency management in university and at colleges for more than 25 years. Dr. Doré's career also shows his ability to combine research and practice in the field of emergency management. In particular, he coordinated the investigation into the management of the 1998 ice storm and led the departmental investigation into preparedness for emergency transportation situations following the storm of March 2017. He also left his mark on the reference documents that are used in the field today: he was the architect of the Politique québécoise de la sécurité civile (Quebec public safety policy). As co-chair of SOREM, he has played a key role in creating the second edition of the Emergency Management Framework for Canada. Mr. Kent has worked with the Prince Albert Grand Council (PAGC) for approximately 20 years. Mr. Kent has two divisions that support Saskatchewan's First Nations communities. The first division is fire and safety where he provides community training in all aspects of structural and wildland/urban firefighting. The second division is emergency preparedness and response, where he provides all aspects of emergency preparedness training to all of Saskatchewan's First Nations communities. Mr. Kent was also seconded by the Federal Government to be a part of a project team to develop and implement a new Federal Office of the Indigenous Fire Marshal. For the past 20 years, Mr. Kent has worked tirelessly to prepare the communities he serves to respond to any emergencies that come their way. Mr. Cornelsen has over 30 years of experience leading, mentoring, and shaping the Parks Canada Association (PCA) fire management program. Mr. Cornelsen is the longest-serving member of PCA's National Incident Management teams, and he has managed multiple incidents. As an Incident Commander, Mr. Cornelsen managed many complex wildfires over the years, including the 2017 inter-agency Kenow wildfire. Mr. Cornelsen was recognized for his evolution of a traditional fire management program that improves the ecological integrity of park ecosystems. Mr. Cornelson's inclusive and proactive approach to fire management programs has rendered him one of the most esteemed professionals in his field. Chief Sampson is an Emergency Management professional experienced in operations, crisis leadership, strategic planning, policy development, response coordination and business continuity. Chief Sampson contributed to the establishment of Calgary's Emergency Operations Centre, which brings together over 60 partners to respond to and recover from disasters. Chief Sampson led and coordinated many of the major events that impacted the province of Alberta, including the 2013 Calgary floods. In 2016, Chief Sampson coordinated the Calgary and Canada Task Force 2 (CAN-TF2) response to the Fort McMurray wildfire. In his community, Chief Sampson also initiated a training program for community leaders and citizens called ReadyCalgary and partnered with Calgary school divisions to create a children's version called ReadyKids. Chief Sampson also started the Disaster Alley, which is a popular emergency preparedness event to help families learn and prepare for emergencies. Chief Sampson has participated on provincial committees and panels that enriched regional resilience, information sharing and capacity building and has shown commitment to advancing the field of emergency management. Chief Sampson has influenced the emergency management profession and built an agency that leads locally, provincially and nationally. Mr. Smith is a tireless advocate for safety and is an enthusiastic and essential supporter of Emergency Management in the Yukon. Mr. Smith has done extensive work through the Yukon Avalanche Association, a not-for-profit and non-governmental organization, where he's assisted at an executive level and through providing forecasting and training. As a volunteer firefighter with the city of Whitehorse, Mr. Smith has demonstrated keen commitment to training and mentorship of fellow firefighters and helped contribute to the professional development of the department as a whole. Mr. Smith is also a founding member of the recently-formed Special Operations, Medical Extraction Team (SOMET), under the Office of the Yukon Fire Marshal, where he provides specialized training to the team and assists with rescue missions at an operational level. With his dedication and specialized skillset, Mr. Smith has demonstrated commitment to fostering and improving Emergency Management in the Yukon. 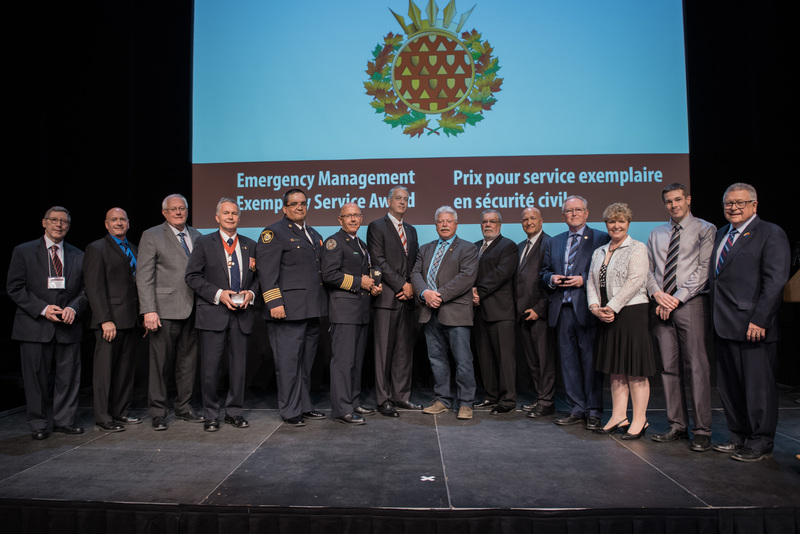 The Honourable Ralph Goodale, Minister of Public Safety and Emergency Preparedness (far right), is pictured with the 2017 award recipients of the Emergency Management Exemplary Service Award for the Outstanding Contribution to Emergency Management category. Mr. Garapick serves as the Regional Superintendent of Search and Rescue (SAR) with the Canadian Coast Guard, where he is responsible for providing on-water SAR response and on-land search planning. With over 30 years in emergency management, Mr. Garapick's achievements, amongst others, center on expanding search and rescue capacity in the Canadian Arctic. He directed the expansion of the Arctic Auxiliary program that created an Inshore Rescue Boat station at Rankin Inlet, Nunavut resulting in 75 new members of the Auxiliary in a number of remote communities, as well as the expansion of new units that will save many lives in the future across the North. Captain James (Jim) Newell serves as a regular Commanding Officer Instructor of the Mobile Facilities On-Scene Coordinator Course. He is viewed as a significant influence of growth to the Clark Harbour Station, which has become a landmark in the community and has also created a sense of community engagement. Captain Newell was an instrumental player in the introduction of the new Bay Class Cutters, which required an extensive amount of expertise and oversight. His leadership and experience has been critical in contributing to the delivery of the first two new cutters (CCGC Pennant Bay & Baie de Plaisance). Through his over thirty five year career, Captain Newell has received many rewards and accolades for his outstanding contribution to the development, delivery and advancement of Search and Rescue capabilities. The Salish Sea 2017 Exercise Team, comprised of Sarah Jane Hughes, Clay Evans, Jeff Brady, Robert G. Dodds, Rodney J. Salem, Cheryl Eisler, Capt. Gregg D. Clackson, Capt. Sebastien J. Lemire, and Major Jeffrey Fraser Allen, designed and delivered the Marine Disaster Response Exercise Salish Sea 17. This large scale, multi-agency mass rescue exercise tested one of the most dangerous events that can potentially occur in the coastal waters of British Columbia. This exercise tested and promoted interoperability between key maritime and partner agencies in the first response domain – enhancing effectiveness of a whole-of-government response to a major maritime disaster. Mr. Smith serves with the Canadian Coast Guard (CCG) in the Joint Rescue Coordination Centre. Through his 40+ year career, Mr. Smith has coordinated and been at the front lines of thousands of search and rescue cases. His quick action and critical thinking directly affected the outcomes of life threatening situations. He has also managed high risk fisheries in the Maritime region and demonstrates a desire and willingness to share information and educate those around him. His secondary files and duties include his efforts to improve partnerships with 911 centers and provincial organizations. Mr. Henderson has been a dog handler for Parks Canada Association (PCA) for 18 years as well as provides support to other agencies, such as the RCMP. In the winter, Mr. Henderson is part of the Mountain Safety Team responsible for recovering avalanche victims and missing skiers; and, in the spring, he conducts general duty law enforcement in addition to supporting provincial agencies. Mike is also a Canadian Avalanche Rescue Dog Association (CARDA) evaluator and has certified and mentored many handlers and dog teams. Mr. Henderson is a true leader in the field of canine search and rescue and law enforcement and is a driving force in the development and integration of volunteer police dog services into avalanche rescue and safety programs in Western Canada. 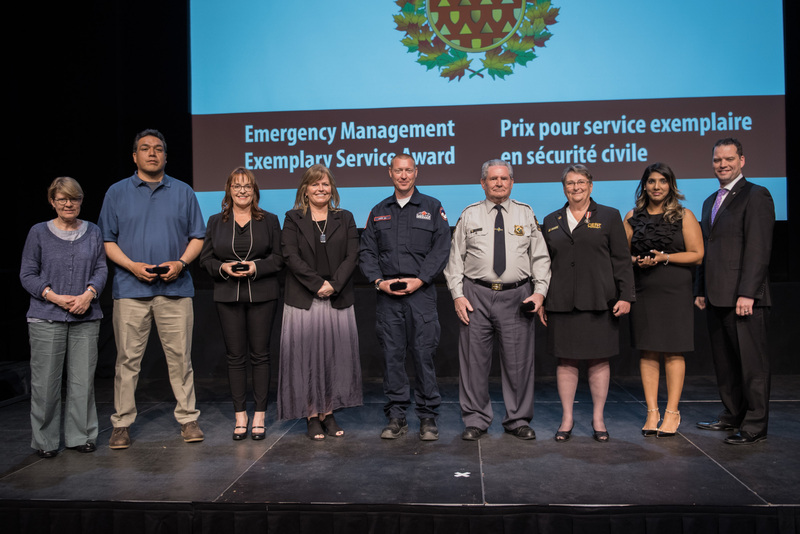 The Honourable Shaye Anderson, Minister of Municipal Affairs and Minister responsible for the Alberta Emergency Management Agency (far right), is pictured with the 2017 award recipients of the Emergency Management Exemplary Service Award for the Search and Rescue category. Mr. Miller, a Public Relations officer for the Exploits Search and Rescue Team in the community of Grand Falls-Windsor in Newfoundland, has been a member of the team for 11 years. Mr. Miller has put in significant volunteer hours with the organization and was instrumental in helping to raise funds for the purchase of a new Mobile Command Centre, a critical piece of equipment for search and rescue in the province. He also contributed to advancing Search and Rescue technology in the province through the development, implementation and training of the Emwerx command software and the ESRI digital mapping system, which ensures the safety of residents in a time of need. Cindy MacEwen, Ken Hall and Scott Stevenson, members of the PEIGSAR, are the driving force behind the expansion of search and rescue across Prince Edward Island. They spearheaded the amalgamation of three teams into one robust provincial team. Their dedicated volunteerism and leadership helped provide the team with specialized training, and critical equipment to achieve a higher level of response. Mr. Lapointe has been a volunteer Search and Rescue (SAR) team member for 27 years and is currently the Quebec representative for the Search and Rescue Volunteer Association of Canada. Through his role as President of l'Association québécoise de bénévoles en recherche et sauvetage, (AQBRS) he developed partnerships with the main organizations involved in public safety in Quebec. This partnership has helped manage recent events such as the vast flooding across the province in 2017. Mr. Lapointe is committed to furthering the education of search and rescue in his province and has published a SAR training manual in French and is currently working on a second. He is currently working on setting up a program for training in First Nations communities, which will include prevention education through the AdventureSmart program. He founded his own volunteer organization, Sauvetage Canin des Laurentides. He was awarded the Governor General of Canada's Sovereign medal for Volunteers in 2017. Ms. Coralie Nairn has 28 years of experience as a Search and Rescue Manager with Vernon and Kelowna Search and Rescue (SAR), 15 years teaching AdventureSmart programming and 8 years with the Civil Aviation Search and Rescue Association. She was involved in the Ground Search Team Leader Instructional Video through the National Search and Rescue Secretariat and was part of the pilot course, SAR Management Level 2 and has played an instrumental role in the effective management of large scale roll-outs. She teaches the Search Management course and other SAR training programs at Justice Institute of British Columbia, and is an Incident Command System (ICS) National Level Instructor. Mr. Purdie has been a member of Royal Canadian Marine Search and Rescue (RCMSAR) since 2007. He has participated at level with fundraising for vessel acquisition and raising the profile of RCMSAR and marine safety. Mr. Purdie's efforts have strengthened SAR responsiveness by participating in policy development at the provincial level and providing a leadership role in training with multiple rescue stations. He has also effectively campaigned for search and rescue public awareness and education. He represented Station 1 on a local level to then allow movement to a larger facility to train and assist in marine emergencies more effectively. Mr. Purdie has significantly contributed to increasing SAR knowledge and skill on the West Coast through with his creation of SAREx, an annual local SAR Exercise, which has grown to host 100 volunteers across Canada. Mr. Qillaq has been a volunteer Search and Rescue member for over 15 years. He helps to organize preparation for searches and is very quick to respond to emergencies when his assistance is needed. His extensive knowledge of land and sea ice conditions surrounding Clyde River is an integral component of the team's successful response. Mr. Piungituq has extensive knowledge and experience with the land around Clyde River and possesses an eagerness to help people, which have both contributed greatly to the volunteer team's success since he joined over 15 years ago. He is one of the top searchers and always takes a leadership role on searches.